The process of tanning and dying leather is ancient. Primitive man was a society of hunters and gatherers who used everything they caught, which meant that after an animal was eaten, its carcass, hair, skin and organs needed to be used. Animal skins quickly putrefy, so these people had to quickly discover a way to preserve them. Final Touch- Giving final touch to leather is most important. The next step that follows drying, is buffing up the leather with the help of a soft, clean cloth for removing the extra dye present on the leather. It also helps the leather to get a polished look. Finally, you have to coat the dyed leather with leather finish. Leather finishes are available in spray cans. You can directly spray it on the leather surface or apply it with the help of a wool dauber. The finish should spread on the surface evenly. Dyeing is a method which imparts beauty to the textile by applying various colors and their shades on to a fabric. Dyeing can be done at any stage of the manufacturing of textile- fiber, yarn, fabric or a finished textile product including garments and apparels. The property of color fastness depends upon two factors- selection of proper dye according to the textile material to be dyed and selection of the method for dyeing the fiber, yarn or fabric. 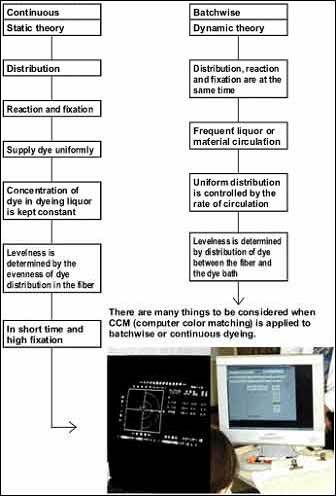 The following figures illustrate with process flow diagrams the whole operation of finishing processes and how the dyeing process is a part and parcel of the process of textile making. Alkalis- NaOH, potassium hydroxide, sodium carbonate. Bleaches- Hydrogen peroxide, sodium hypo chlorite, sodium chlorite etc. 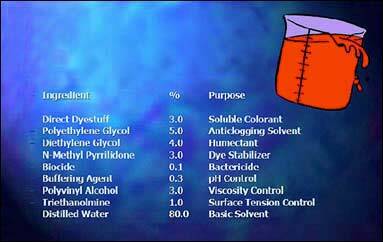 Dyes, for example direct, disperse, pigment, vat. Stabilisers from sodium silicate, sodium nitrate also organic stabilisers. Color is applied to fabric by different methods of dyeing for different types of fiber and at different stages of the textile production process. These methods include: Direct dyeing, Stock dyeing, Top dyeing, Yarn dyeing, Piece dyeing, Solution pigmenting or dope dyeing, Garment dyeing etc.